Education in the 21st century faces an open world of possibilities. ​Developing societies hunger for access to new knowledge. Online technologies can reach a global audience. Students now consume digital content in entirely different ways. How do we tap into these fast-evolving trends to deliver on the promise of education? Skyship Design utilizes cutting-edge tools to empower instructors, while never forgetting the core practice of teaching and pedagogy. We "speak the language" of both technology and liberal arts, allowing us to pioneer some of the earliest social science MOOCs to be offered by Stanford University to a worldwide audience. 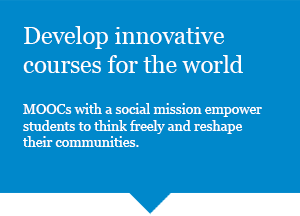 Today, we develop open online courses (MOOCs) and enhance existing classrooms with the use of digital tools. We are on a social mission, focused on crafting the best possible experience for students, so they can learn, grow, and shape the world. The time to write the next chapter in education is now. From technology consulting to curriculum development, we empower you to take advantage of new trends in education. ​We help you navigate the "winds of freedom."